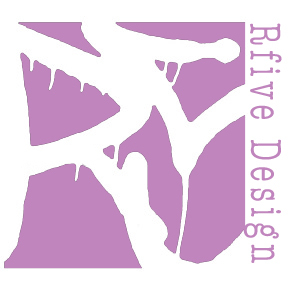 You are currently browsing the monthly archive for 12月 2008. My bento lab started in 2006, for my husband (boyfriend, at that time) Roy. 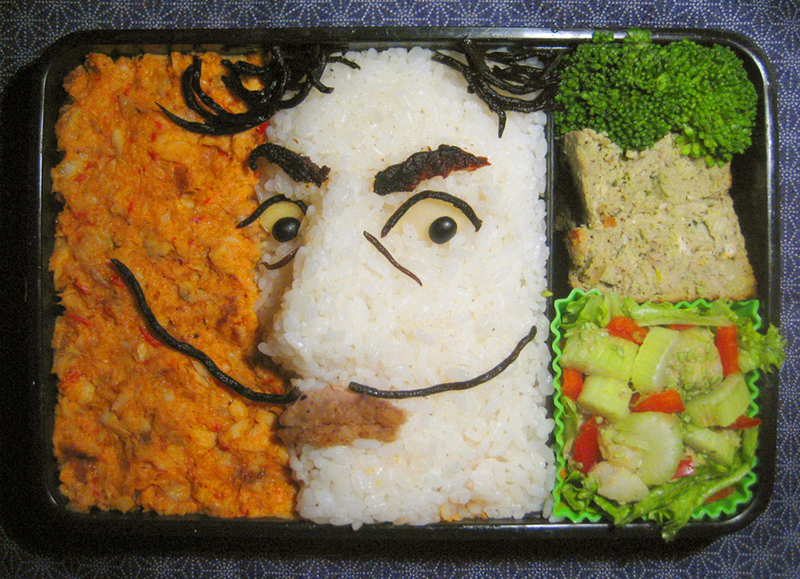 He has been taking pictures of his bento lunch, and it motivates me to continue making them. 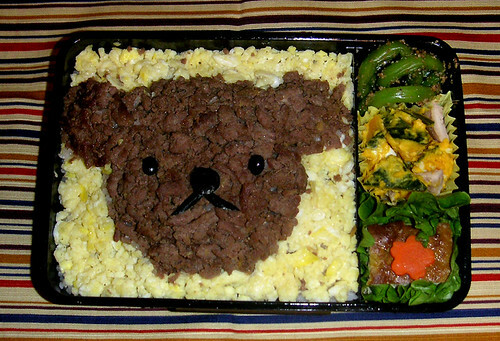 I was starting to get interested in cooking, and making bento was a perfect way to create with food. I grew up with my mother’s colorful & delicious food, so I always think about how it tastes and how it looks. I always wanted to draw with HIJIKI (seaweed). And thanks to Señor Dali, for being such an inspiration. I got this recipe from my mom. 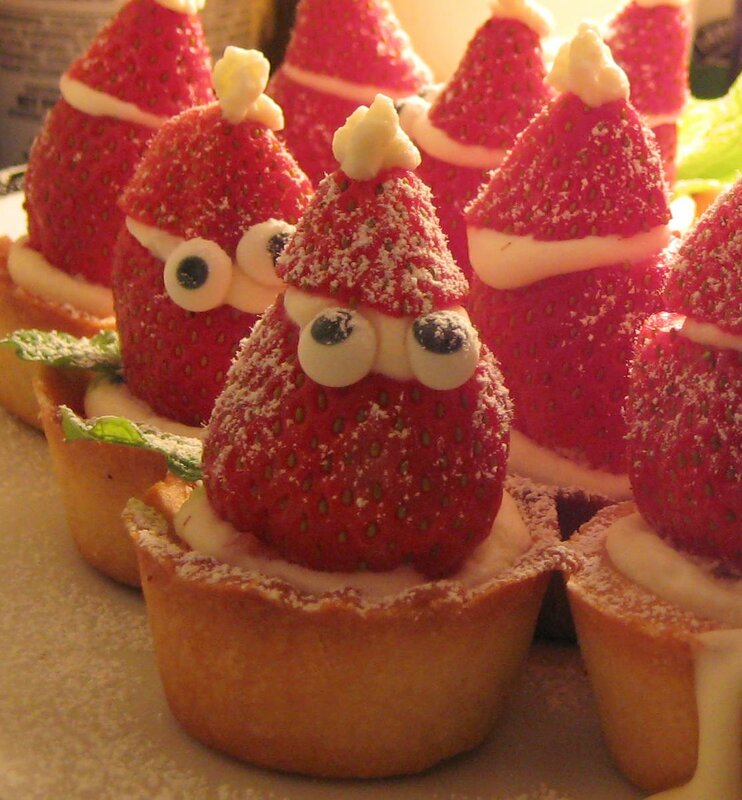 The tart is tasty even without cream and fruits, but she makes them look like Santa Claus for Christmas. Her Santa has bigger face and smaller eyes, but my cream was too soft and didn’t rise as a face. Happy Holidays anyway…!! 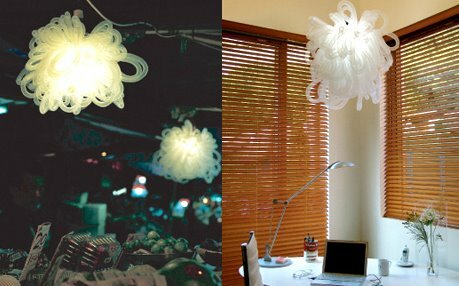 This lamp shade Kapow was a wedding gift from my friend, Julie Jeane. She had no idea how oddly similar this is to my head dress. 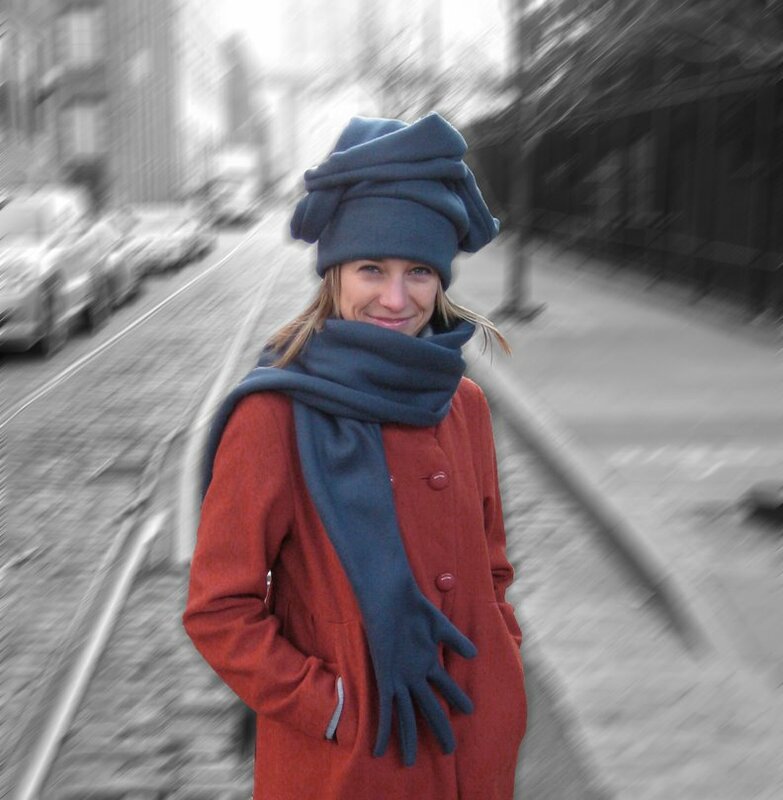 And this is the head dress….Our wedding was at Park Güell, Barcelona, in summer of 2008 (we got married in 2007). The person who eats my bentos. Ground turkey on rice can’t miss with him. 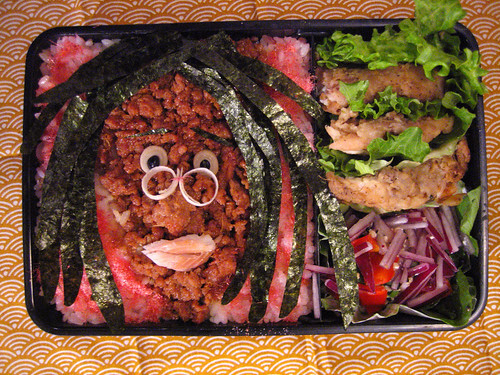 Smoked fish make the lips and the hair is NORI… He was surprised. 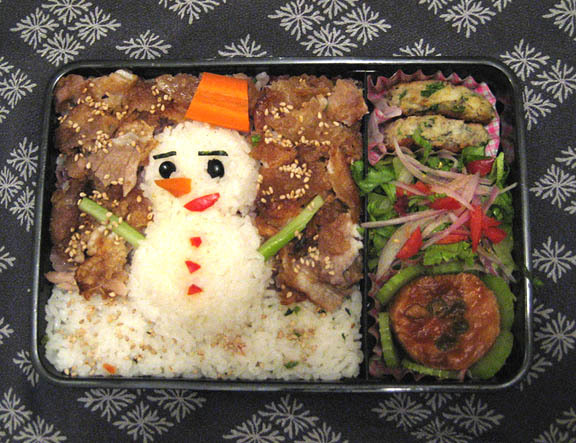 Pork SHOGAYAKI (ginger) bento. I like this type of standard bento the best (for myself). 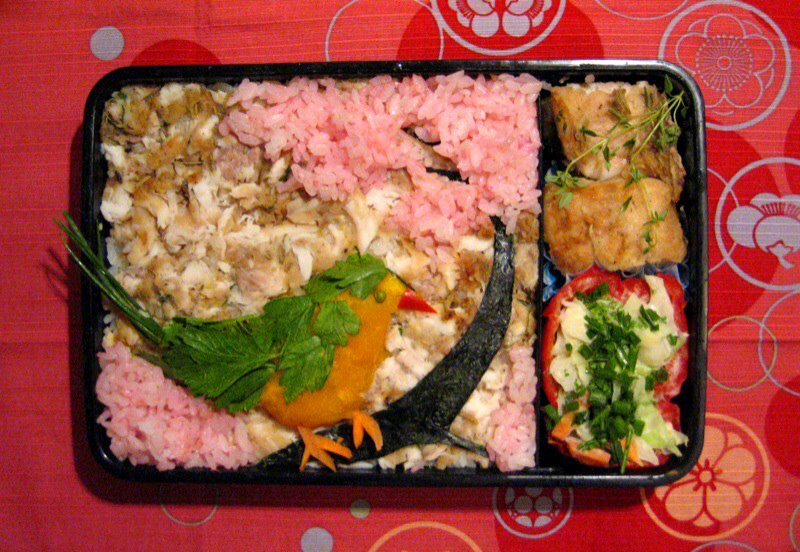 SOBORO bento is another standard. It usually consists of 3 colors of brown (meat), yellow (egg), and green (vegetable), each crumbled and seasoned . I just wanted to draw Boris, who is a friend of Miffy’s. 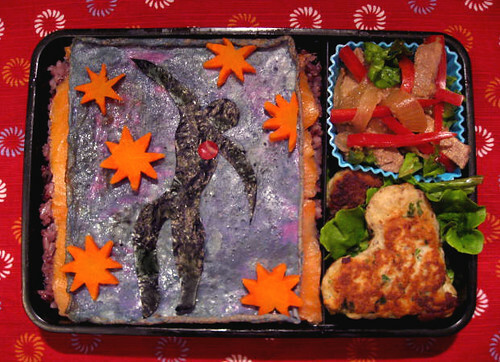 This bento was inspired by the image of Icarus in Jazz by Henri Matisse. I love his paper cut-outs. So I cut out some NORI, and carrot to reinterpret the original. 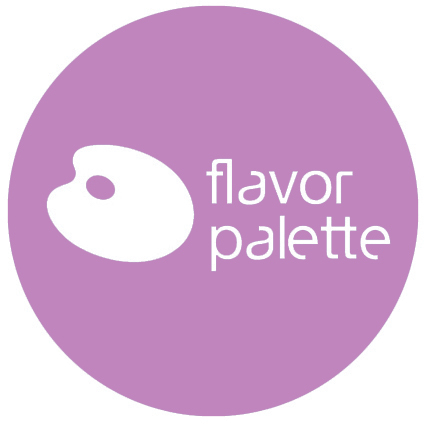 The blue background is egg white with purple potato powder, which doesn’t have a distinctive flavor, but goes nicely with the smoked salmon underneath. 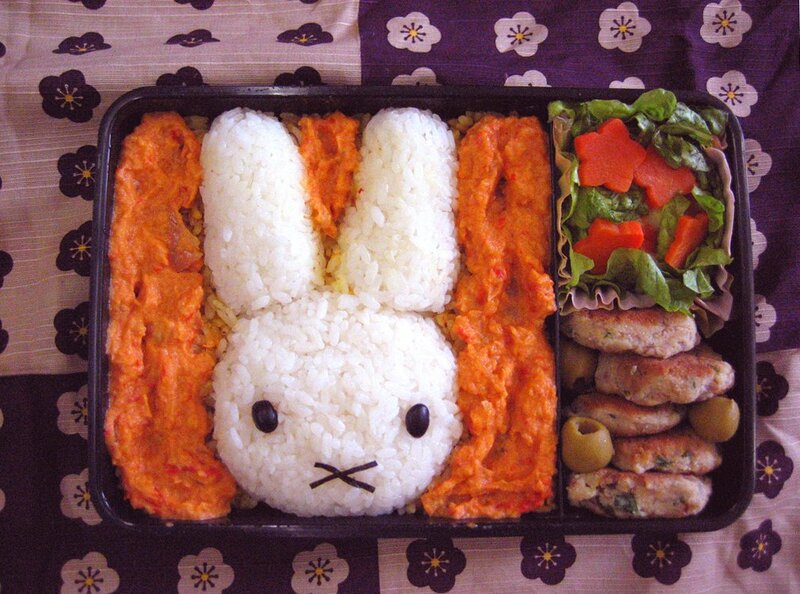 I thought it would be funny if a grown up man brought a lunch to his work with bunny face on it. I was a bit disappointed that he didn’t get embarrassed at all when he showed it to his co-workers. Miffy has been my friend since when I was a baby. The book of Miffy might have helped me become an artist, since the designs are so graphic! Orange sauce is red pepper & onions. The face is white rice but there are curry flavor rice on bottom. 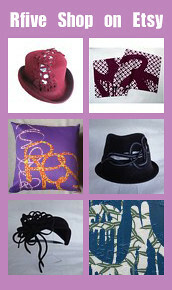 Seasons Greetings! Our winter hats are now available online in stores below.